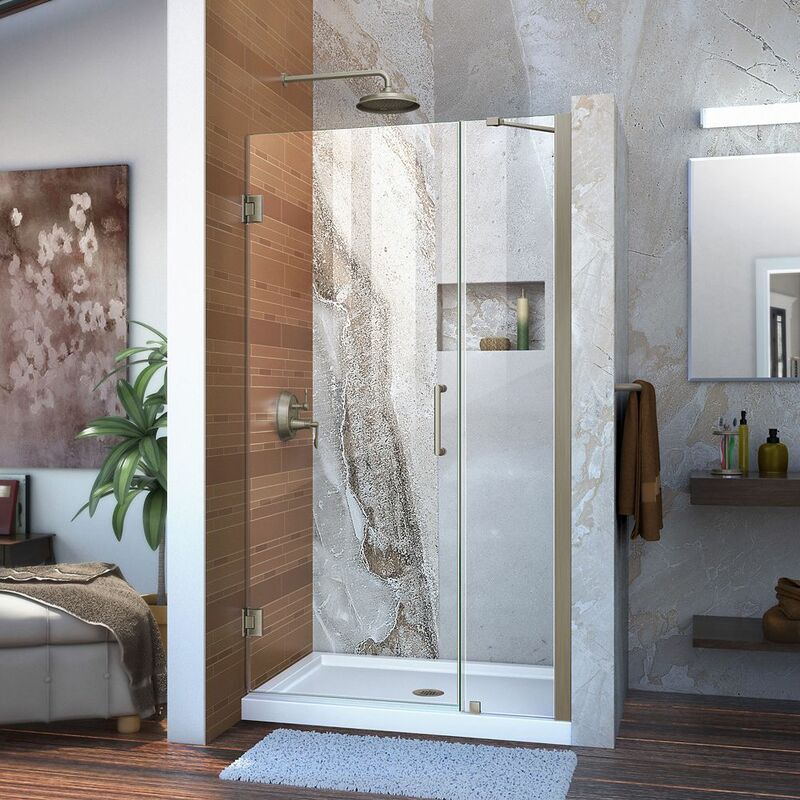 The DreamLine Flex pivot shower door or enclosure has modern appeal and a semi-frameless design that is ideal for those that want the beauty of frameless glass, but have budget or design limitations. The versatile Flex model combines cutting-edge pivot hardware and an impressive capacity for width adjustment, which simplifies installation and offers dependable performance. Complete your bathroom with the elegant and innovative look of the Flex model from DreamLine for the ultimate solution for your shower project. Unidoor 36 to 37-inch x 72-inch Frameless Hinged Pivot Shower Door in Brushed Nickel with Handle is rated 4.7 out of 5 by 3. Rated 5 out of 5 by CJ in BRS from Love this door! We had this door installed in our guest room, and it is THE BOMB! Unfortunately, we have another brand installed in our master suite, and I much prefer this one. Find myself showering in the guest shower frequently just because of the door. It just seems so sturdy for a frameless door. Rated 5 out of 5 by joce from Great shower door, easy to install My husband and I installed this shower door without any problems or hitches. The instructions are very clear and easy to follow and the door looks really nice. The glass is thick and good quality. We are very happy with our purchase. We appreciate that DreamLine took some time to write clear and detailed instructions. That is not always the case with buying something that needs to be assembled or installed. Thanks. Rated 4 out of 5 by BobP from Looks expensive-installation no too complicated. After getting bids from shower door companies in the thousands, I was determined to install one myself. It turned out great and installation wasn't too difficult to install.